Very good, friendly & reliable service. Recommend Billiot Pest Control to all! The Billiot team has always been prompt, helpful, courteous, and informative. And I ask a lot of questions! Been a customer for 13 years. Love love love Billiot! Couldn’t ask for better! Definitely helped with my roach problem ! 100% satisfied ! Every tech has been friendly. These guys are the best! They're professional, courteous, friendly and best of all, they get the job done. We had a termite problem last year and just had our annual inspection done and no sign of termites. I highly recommend Billiot Pest Control. They've been around forever and I know why. These guys know what they're doing. If you have a problem with any kind of pests, don't hesitate to call them. Your men were very knowledgable and did their jobs very efficiently....Brent worked and knew exactly what he was doing...we are really pleased we got the new contract since ours were obsolete...Thanks for the good job they did.....Priscilla Sampey. Excellent products, timely service, personable personnel. We’ve been customers for several years now and it’s always been a great experience with fantastic service. No complaints! Billiot's customer service is second to none. Billiot is very responsive and my rep Lee is fantastic. I use to see bugs often but since Billiot it is 90% gone. I will continue the service because they are a terrific company. Always on target thank you. Yes I’m always happy and satisfied, but not so this time, because i think he rush everything to fast, and did not spend time out side. I have been a client of Billiot's for over 11 years and anticipate remaining with them as long as I own a home. They are prompt, thorough, efficient, courteous, and dependable. Service was done well and in a good amount of time the tech is very polite and did his inspection well. Thank you for the review! It's great to hear you were happy with your service. Lee is always friendly and on time!!! Love my services with Billiot!! Thank you for the review! I will pass the message along to Lee. Showed up on scheduled time and inspected inside & outside our home, and briefed us on the service they accomplished. We considered that we received the best service and feel safe about no pest were present on our property. Thanks. Billiot Pest Control is perfect for my busy life. I get a text that service is due, then I send my available dates and times that's convenient for my family and schedule. They are always on time which is good because I'm on the go again right after. 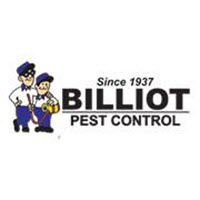 I get answers to all my pest questions and a solution to pest problems, thanks Billiot. Thank you for the great review! I will pass your message along to Mike. with no matter what I call about. Thanks Billiot Pest Control. Thank you so much for the review! I am happy to hear that you are satisfied with your service. Excellent service. Technician made every effort to make the customer satisfied. I am very happy to hear that. Thank you for the review. The office personnel is very pleasant and knowledgeable. The service technician regularly checks my bait traps and will come if I call. Ernie is the most informed and efficient employee at Billiot’s. We are glad to hear you were happy with you service. Thank you for the review. Tech arrived on time and treated the house. in a few hours I saw a big difference. Thanks Billiot for allowing me to reclaim my home. As a new customer I am happy with the service. Thank you for the review and your business. We’ve been a happy client for 14years &Jeff has been keeping our house bug free! Happy to recommend Billiot ‘s to others 😊👍🏻. Thank you for the excellent review! I will definitely pass the message along to Jeff. I was very pleased with the service. The tech was thorough and friendly. Mauron is the best. So glad he is back!! Great service! Would highly recommend! Service techs are polite and professional. The tec did a great job. Thank you. Used Billiot Pest Control for first time recently. They did a very good job and I am pleased with their services. Professional service and courteous salesman.